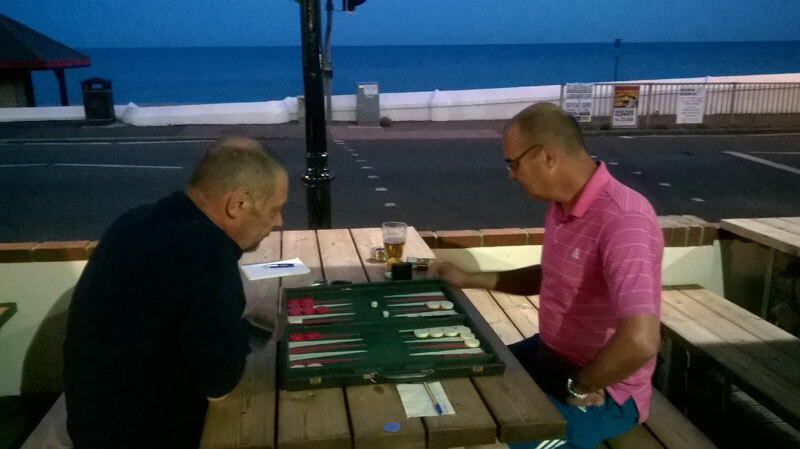 Our first meeting of Bognor Backgammon club on the 12th of August attracted 8 players and we had some friendly 1 point all play all matches with a couple of 5 point matches for those with experience of using the doubling cube. Could there be a better setting for an evening of fun then overlooking the sea with a pint as dusk falls with Trevor and landlord Barrie doing battle here. Bognor Backgammon players at the Waverley Pub. database, at http://results.ukbgf.com/bognor/ratings new players can gain a ranking here too.